Boy draws water from cistern in the village of Khirbet Jenbah, South Hebron Hills, which is not hooked up to water grid. By Sharon Azran, B’Tselem. Most of the West Bank governorates suffer from severe water shortages. In 2011, around 88 MCM of water was supplied to the Palestinian communities for domestic use. Of this, approximately 53% was purchased from Mekorot, while the water quantities supplied from local resources reached almost 42 MCM. In 2011, the total real deficit in domestic water supply reached 62.4 MCM for the whole of the West Bank. [i] On average, domestic water supply covered only 73% of the demand. 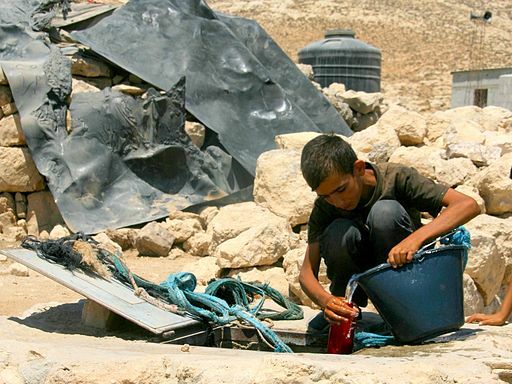 While Palestinians have an intermittent supply, and over 25% of their homes are not even connected to the municipal network, Jewish settlers receive a continuous water supply, largely from groundwater wells in the West Bank. Figure 9. Water consumption in Israeli settlements and nearby Palestinian villages. Source: Richard, 2012, after B’Tselem, 2011. Moreover, many residents of neighbourhoods and villages that are connected to the municipal network receive water only one day a week or only once every few weeks. This leaves them no choice but to buy more expensive and lower quality water from private suppliers who use mobile water tankers. [i] PWA, 2011b. Annual Status Report on Water Resources, Water Supply, and Wastewater in the Occupied State of Palestine. Available at: http://pwa.ps/userfiles/file/تقارير/Annual%20Water%20Status%20report%202011.pdf, accessed 2 May 2015.